The way to transfer files from one computer to another is very convenient for users who work on different computers installed Windows 10, 8 or 7. AOMEI Backupper provides you sync files on two folders. Can I transfer files from one computer to another? When you buy a new computer, you may think the question: "can I transfer my personal data from the old computer to the new one"? A lot of people want to transfer their existing files to another computer so that they can keep their old data like photos, music, videos and so on while they use the one. Sometimes, you may not finish your work at office, like doing an Excel, but you have to go home. Well, bring the unfinished excel to home and continue to finish it would give a big help. There are many ways for you to transfer files from one computer to another one. You can move your data as the way you want. As we mentioned above, there are many ways to move files between two computers. An external storage media, like a USB flash drive, is a good helper for transferring files. Usually, you can plug the USB into the old computer, copy the files you want to transfer, then, open the USB flash drive and paste the files on. Then, plug the USB flash drive into the new computer, use the copy and paste to move the files to the new computer. If you are planning to bring the files to home for a continue work, you can copy the files to your USB too, then, when you back to home, plug the USB in to your computer and open the files to continue work. If the two computers are at the same network, you can use your existing home network to transfer your files from one computer to another one. To share it over LAN in Windows, browse to My Computer-> Properties, right click it. In the sharing tab, you can share the files here. You can bought a cable to transfer files between two computers. You can use the cable to connect two Windows system and transfer files between two computers. Nowadays, many software can help you transfer your personal data from PC to PC. No matter where the two computers are. The most important thing is that you should find a suitable software. To do this job, AOMEI Backupper is the best choice. 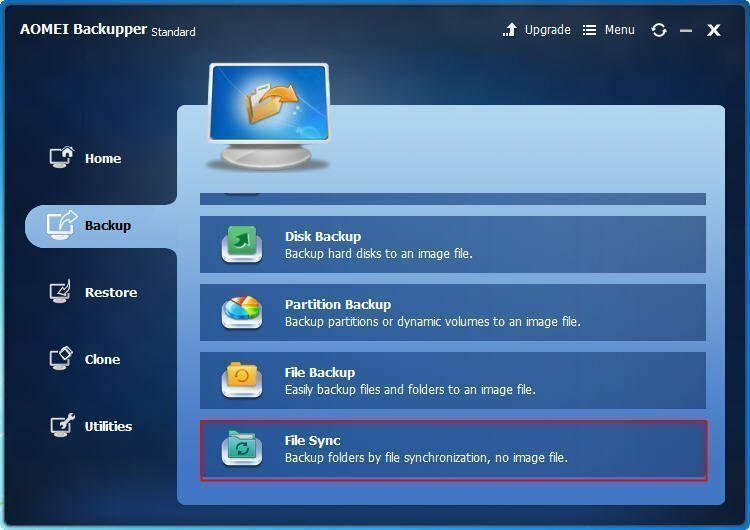 It can synchronize files/folders between two computers, and it has many other utilities, such as backup & restore system, partition, disk, etc. How to transfer files from one computer to another one with AOMEI Backupper? AOMEI Backupper Standard is a free edition for Windows PC users. It supports Windows 10/8/8.1/7/Vista/XP. 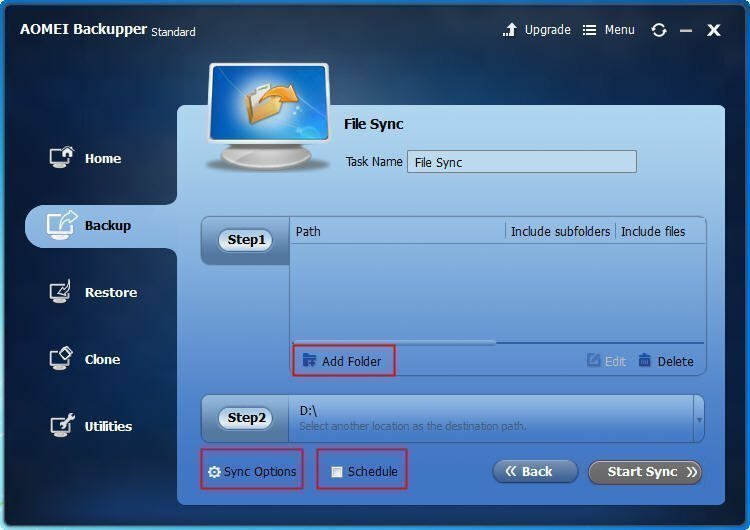 The feature “File Sync” can help you transfer your data from one computer to another. Here are the specific steps. Step1. Download the freeware, install and launch it. Click File Sync under the Backup tab. Step2. Click Add Folder to select the files/folders which you would like to transfer to. Then, click Step2 in the interface and select a destination path. Usually, we share it on NAS through network so that we can use another computer to open the same files. You can set up more specific requirements here by clicking Sync Options, and you can also click Schedule to set up an automatic file sync. step3. After all the settings, click Start Sync to launch the progress. When the progress reaches 100%, click Finish to exit. With AOMEI Backupper, transferring files from PC to PC seems easier and simpler. The data changed on the source, it will be changed on another computer automatically. besides this, you can backup changed files automatically with AOMEI Backupper, which is very convenient. However, AOMEI Backupper Standard only supports Windows PC users, if you are a Windows Server user, the AOMEI Backupper Server edition is suitable for you.